In September 2005, when Rio’s twelve Special Samba Schools moved into Cidade do Samba, the spectacular new complex of workshops down in the Gamboa dockland district, it was the realization of a long-held dream. It was also a further affirmation of the place of the Samba as the country’s national dance and of Carnaval as Rio’s premier event. It was one more step in Rio’s, if not Brazil’s, historical journey. 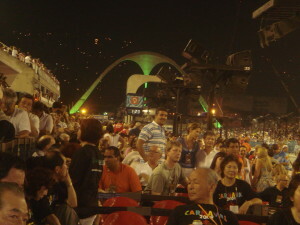 The Sambadromo, which opened in 1984, had given the Samba and Carnaval its own special stage. But for over half a century, the Samba Schools had dreamed of a dedicated site where they could put together the fantastical floats and costumes which embody the themes of their spectacular parades. Until mid last century, a single float, decorated in a local yard, led each school’s parade. But as the floats multiplied in numbers and developed into complex stage sets, more space was needed. Makeshift community workshops were set up in barracoes or sheds. In time these too proved inadequate and inconvenient. A large central space was needed. In the 1970s the Mayor turned over the half-ruined Sao Cristovao Pavilion to the Samba Schools but fire broke out in the ramshackle building and in the 80s the workshops moved again, to the abandoned warehouses near the Docklands. They were closer to the Sambadrome, but as Carnaval grew into a giant extravaganza worthy of the new venue, the dockland workshops became more inadequate. Finally, in 1999, the Mayor, Cesar Maia, agreed to build Cidade do Samba or Samba City, a complex of permanent Carnaval workshops on the disused rail yards near the docks in the Gamboa District. It was a significant site. Gamboa lies at the centre of the famed “cradle of Samba” between Santo Cristo and Saude, where in the 18th century, the slave markets flourished, where the first Sambas were danced to the beat of African drums, where they evolved and blossomed into the great Brazilian boogie of today and where some of Carnaval’s greatest stars and sambistas made their homes. 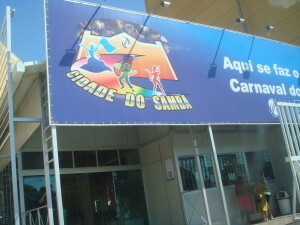 Work began on Cidade do Samba in August 2003. Designed by architects Joao Uchoa and Victor Vandelay, it is modeled on the old Gamboa warehouses which surround it. It is built around a central plaza and consists of 14 workshops providing all the technical and technological support needed to realize the Carnaval parade – 12 metre high ground floor float assembly areas, top floor costume, millinery and props workshops, sculpture and modeling studios, along with bathrooms, kitchens, canteens and offices. Samba City’s 19000 square metre complex welcomes thousands of visitors each year. Not only can they tour the workshops and see the Carnaval floats and costumes in progress but they can also see snippets of parades past and future, in Samba City’s shows and exhibitions. There are Snack Bars and restrooms. Boutiques sell Carnaval paraphernalia and souvenirs. True to the spirit which gave birth to the Samba Schools and which governs them still, a large section of Samba City houses a sports complex, with facilities for underprivileged communities. The Sambadromo, the home of Carnaval, is a one-off among world stages, a uniquely Rio answer to a peculiarly Rio question – how to create a fitting venue to contain and channel the huge extravaganza, which, by the 1980s, had grown too unwieldy and unruly for the streets? The final solution was sketched in 1984, by Oscar Niemeyer, the godfather of modern Brazilian architecture, on a paper napkin, in a bar. It was completed just 120 days later. Named the Sambadromo for the Samba, the official dance of Carnaval, it is also located, fittingly, in the birthplace of the samba, in the heartland of the favelas, or shanty towns. The architecture of the Sambadromo also gives a nod to the dance; two giant arches represent the g-string framed buttocks of the sambista, the gorgeous, dancing goddess of Carnaval. And thank goodness for this bold flourish. Otherwise the Sambadromo is a great, grey, terraced, concrete canyon wrapped around a 590 metre long, 13 metre wide procession route. This is definitely a building that needs a crowd. Empty, it’s quite forbidding. Packed to capacity, with a 70, 000 strong crowd flying the colours of their Samba School, a procession of 3000 brilliantly costumed performers and the unforgettable sound of the batteria or the drums, it’s amazing!